The Martinez Street Women’s Center, the Antioch Missionary Baptist Church, and the San Anto Cultural Arts (SACA) completed a mural depicting and honoring local African American women and their inspiring contributions and lives while living in the East Side of San Antonio. The mural’s unveiling took place at 2603 East Houston Street on August 27 while the summer’s afternoon sun steadily beat down on the surrounding pavement and sidewalks. While walking up to the E. Houston street mural unveiling, one can not help but feel that this is San Antonio at its finest; there were free raspas from Chamoy City Limits and a tortilla press was being used as a stamp print for artists. There were also free school supplies being handed out to kids who needed them, and DJ Despeinada was spinning music while people danced in the hot sun. But most importantly a community of artists came together to build an inspiring monument to those that helped build the east side. The African American women depicted in this mural all went through hardships and struggles to represent and help define their community, and the story that the mural is meant to inspire and convey is that despite those hardships, one can still achieve and create greatness. The ceremony began with a prayer from Rev. Kenneth R. Kemp from the Antioch Church, who then passed the mic to Andrea Figueroa, the executive director of the Martinez Street Women’s Center. Figueroa made sure that local residents had input into what would be depicted into the mural by holding community input sessions. U.S. Rep. Lloyd Doggett (D-35) and District 2 San Antonio City Councilman Alan Warrick both attended the mural unveiling and spoke briefly about the mural and the significance of it for the Eastside community. 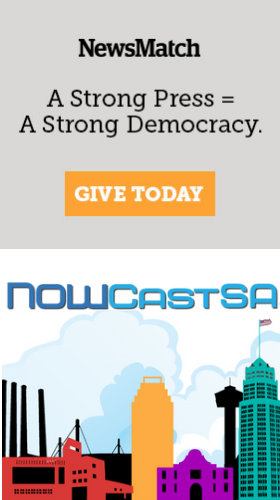 “We really wanted to make it an African American wall because of where it is: in the heart of the Eastside San Antonio," Figueroa said. 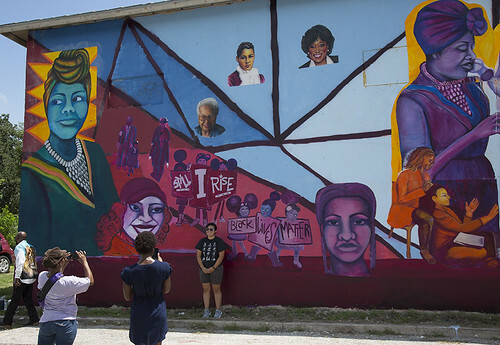 The mural contains illustrations of respected African American women in the San Antonio community such as Ella Austin, Ruth Jones McClendon, Mayor Ivy Taylor, Ethel Minor, Myra Davis Hemmings, and Artemisia Bowden. This marks the 51st mural in San Antonio created by SACA in collaboration with the Martinez Street Womans Center and AMBC, but remains the first one within the Eastside community. The mural was led by artists Rabbit Rye and Jane Madrigal, while the portraits were drawn by Antioch church member, Raashad Ali. One sentiment was repeated by many individuals at the ceremony and block party. And that was the work of two communities coming together. “This is my neighborhood. My uncle’s house is literally right behind this mural. This is the East Side and the West Side, working together to make sure that we are recognized,” Madeleine Santibanez said. As San Antonio grows into a more affluent city, murals like this exist to remind us of our history, and remember that these neighborhoods should never be forgotten as San Antonio’s downtown center expands. This mural serves as a reminder that the Eastside matters and is represented strongly and wholeheartedly by its community members. Michael Marinez, an artist from SACA defined the mural beautifully. That is the real message of this mural, the first of its kind in the East Side, that their community can triumph and their story is worth telling. Editor's Note: This article was originally published with a quote attributed to the artist Rabbit Rye. However, this article has been corrected to reflect Madeleine Santibanez as the individual reflecting on her neighborhood.